Cisco has launched a new campaign that showcases how the company connects the unconnected, and makes ‘amazing things’ happen. Hello, Internet of Things! Cisco’s campaign, developed with branding and advertising agency Goodby Silverstein & Partners, introduces the tagline Tomorrow Starts Here. There’s broadcast advertising, digital and social media, besides augmented reality-enabled print advertising. Clients of Goodby Silverstein & Partners include Adobe, Google, Xfinity, Nintendo, Comcast, TD Ameritrade, YouTube and Netflix, among others. John Chambers (Chairman and CEO, Cisco): When the Internet emerged just over two decades ago, it changed everything. But what we’re about to see makes that pale in comparison. 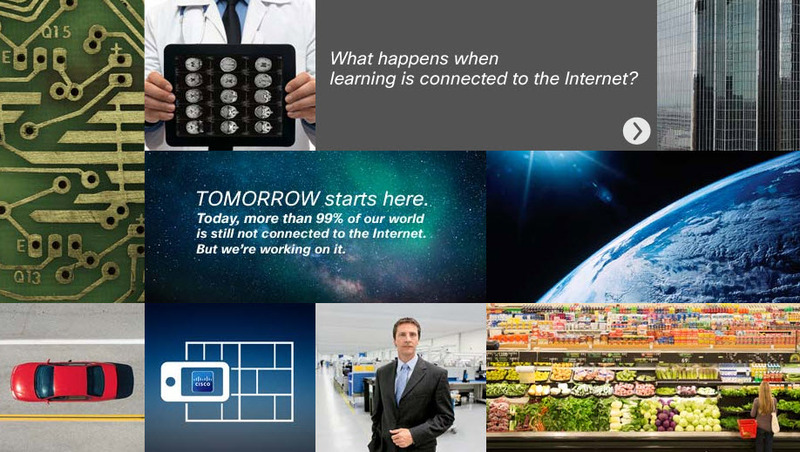 The Internet of Everything will disrupt all kinds of industries. That means new opportunities, new businesses, new experiences and new services. And big opportunities for people, companies, and countries. “The Internet is only 8000 days old. 2.5 billion people and 37 billion things will join the Internet by 2020. And Cisco believes this is just the beginning. 99 percent of things in the physical world are still unconnected, ready to be woken up. ” This is an excerpt from the official Cisco media release announcing the campaign. That’s some powerful copy writing right there!